If not for one of the many advantageous reasons above, you may also want to consider BFRT, without injury, simply for the purpose of quickly gaining muscle, strength or improving aerobic capacity, which is done by professional and U.S. Olympic Sports teams. Blood Flow Restriction Training has an immense amount of evidence supporting its use for gaining muscle and strength, with systematic reviews, meta-analyses and randomized controlled trials (some of the highest quality studies available) demonstrating its benefits and safety. If someone told you that you could gain muscle and strength very quickly from lifting only light weights, you would likely brush it off as a misleading claim such as those we’ve heard on infomercials (i.e. “The Ab Blaster Belt will melt away your body fat and give you six-pack abs!”). There has been far too many products or services guaranteeing results with minimal effort, and much to the detriment of consumers wallets and time. We know that strength training is extremely important across the lifespan for the health of our joints, bones, muscles, tendons, ligaments, and even our cardiovascular health. Strength training is what gives us quality of life, as staying strong helps us to do the activities we want to do and reduces our risk of injury. Let’s give an example of a common scenario in which we would help someone using BFRT with in the clinic. “Holly” is a busy professional and mother and enjoys hiking, walking the dog and spending time with her family and friends. She recently found out that her knee pain is due to knee arthritis and opted to receive an injection to help with pain relief. After speaking with her physician and doing her own research, she knew that in conjunction with injections, strengthening has the best long-term success for reducing knee pain and maintaining the joint’s health. Traditionally (without BFRT) to get meaningful results from strength training, Holly would have to lift weights that are 70% or higher of the MAXIMUM weight she could possibly lift for that exercise, and for a certain number of reps and sets. That means that if the absolute highest weight she could lift with her legs (on the knee extension machine) is 50lbs, Holly would have to lift 35lbs for 2-4 sets of 8-15 repetitions. At this weight, she is working very hard in order to achieve the muscle-building stimulus in her quadriceps muscles. After performing this exercise for 3 MONTHS, 3 days per week, she would then start to see some muscle and strength increases. One of the major problems for her though is that this weight is not tolerable because it is too intense and irritates her knee pain…this becomes a double-edged sword because she knows she needs to build strength and muscle to improve her knee pain, but is not able to exercise effectively due to the knee pain…you get the idea. With BFRT, however, Holly would only have to lift weights at 20% of her maximum rather than 70%. This means she would only select the 10lb plate rather than the 35lb plate for the knee extension exercise. At this weight, she has no knee pain at all, and in fact feels a little bit better immediately after the exercise. After doing BFRT in the clinic for 2 WEEKS, 2-3 days/week, she begins to build lean muscle and has measurable strength improvements. She also notices some improvement in pain reduction already. She may then decide to continue with BFRT or transition to heavier, traditional weights as they have become comfortable. Her PT sessions become less frequent, perhaps 1 day/week or less, and after 8 weeks, her arthritic knee pain is nearly fully gone. She is able to keep up with her dog and kids and even play tennis again. With the help of her PT she is fully comfortable transitioning to her own traditional exercise routine in the gym or at home to maintain her progress. Yay for Holly! Blood Flow Restriction Training is used across the spectrum from elite athletics to injury rehab or post-surgical rehab. From players in all the major professional sports leagues, to patients in hospital intensive care units, BFRT is used with the direction of medical professionals to quickly and safely build muscle, strength, aerobic power, and function. Additional benefits may also include increased bone mineral density. With a high number of quality studies, BFRT is proven safe and effective when used appropriately under the guidance of a trained medical professional for developing muscle, strength, and endurance without lifting heavy weights or without running sprints. 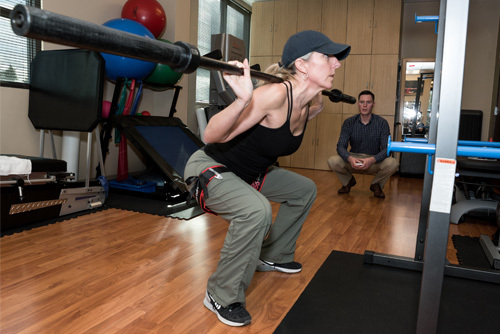 At SportsCare Physical Therapy, we use the highest quality medical-grade BFRT equipment and methods to ensure the value, comfort, and safety of the treatment. Our staff are highly trained and will evaluate if BFRT is right for you. If you’d like to learn more about BFRT, you may call, email, visit our clinic or click here to schedule an appointment. Already a patient? Simply speak directly with your Physical Therapist to see if BFRT is right for you within your current care plan. We’re happy to help!